Today's families need direction, hope, and encouragement. This series is intended to counter enemies of the home, such as the conflict of roles, addictions, entertainment, and more. 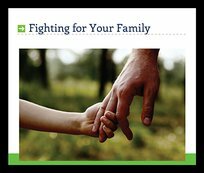 Best of all, it includes encouragement on how to pray for our children and how to prevent divorce. God desires to help us take courageous, decisive action so that we can more readily refuse to believe the lie that there is no hope for our marriages and our families. In short, these messages are intended to improve good marriages, repair bad marriages, and foster healthy families.